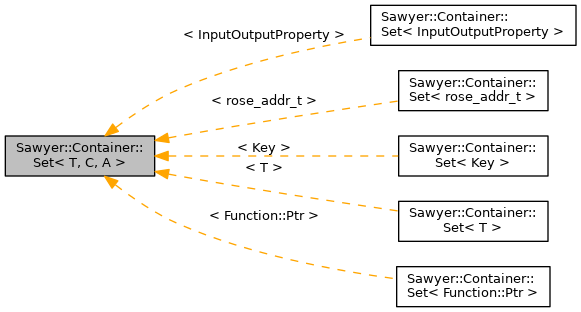 The interface uses the Sawyer CamelCase naming scheme where types start with an upper-case letter and lack a "_type" or "_t" suffix and methods start with a lower-case letter. Like other Sawyer containers, iterators are returned as a range rather than individual begin and end iterators. Only const iterators are supported since it should not be possible to change the value pointed to by the iterator. The "empty" predicate is named isEmpty. The existence predicate is named exists instead of "count". The insert and erase mutators are simplified. They don't take iterator hints and they return a Boolean indication of whether any operation occurred. The container understands union, intersection, difference, and equality. Although this makes the library larger, it alleviates the user from needing to invoke a separate function for these operations. Definition at line 46 of file Set.h. Type of values stored in this set. Definition at line 50 of file Set.h. How to compare values with each other. Definition at line 51 of file Set.h. How to allocate storge for new values. Definition at line 52 of file Set.h. Iterator for traversing values stored in the set. Definition at line 53 of file Set.h. Constructs a new set containing no values. Definition at line 73 of file Set.h. Constructs a singleton set having only the specified value. Definition at line 79 of file Set.h. Definition at line 94 of file Set.h. Definition at line 99 of file Set.h. Definition at line 105 of file Set.h. Definition at line 109 of file Set.h. Returns an iterator range that covers all values in the set. Definition at line 121 of file Set.h. Referenced by Sawyer::Container::Set< Function::Ptr >::erase(), Sawyer::Container::Set< Function::Ptr >::existsAll(), Sawyer::Container::Set< Function::Ptr >::existsAny(), Sawyer::Container::Set< Function::Ptr >::insert(), and Sawyer::Container::Set< Function::Ptr >::operator|=(). Whether the set is empty. Returns true if the set is empty, false if not empty. Definition at line 132 of file Set.h. Referenced by Sawyer::Container::Set< Function::Ptr >::greatest(), Sawyer::Container::Set< Function::Ptr >::hull(), and Sawyer::Container::Set< Function::Ptr >::least(). Returns true if value is a member of the set, false if not a member. Definition at line 139 of file Set.h. Referenced by Sawyer::Container::Set< Function::Ptr >::existsAll(), Sawyer::Container::Set< Function::Ptr >::existsAny(), Rose::BinaryAnalysis::Partitioner2::CfgVertex::isOwningFunction(), Sawyer::Container::Set< Function::Ptr >::operator&=(), and Sawyer::Container::Set< Function::Ptr >::operator-=(). Returns true if any of the specified values exist in this set. Definition at line 146 of file Set.h. Returns true if all specified values exist in this set. Definition at line 157 of file Set.h. Returns the number of values that are members of this set. Returns the smallest member of the set. The set must not be empty. Referenced by Sawyer::Container::Set< Function::Ptr >::hull(). Returns the largest member of the set. The set must not be empty. Definition at line 183 of file Set.h. Returns a range having the minimum and maximum members of the set. Definition at line 193 of file Set.h. Whether two sets contain the same members. Returns true if this set and other contain exactly the same members. Definition at line 202 of file Set.h. Whether two sets do not contain the same members. Returns true if this set and the other set are not equal, although this method is faster than using !(*this==other). Definition at line 210 of file Set.h. Inserts value into the set. Returns true if the value was inserted, false if the value was already a member. Definition at line 222 of file Set.h. Referenced by Rose::BinaryAnalysis::BestMapAddress::insertEntryAddress(), Rose::BinaryAnalysis::Partitioner2::CfgVertex::insertOwningFunction(), Rose::BinaryAnalysis::BestMapAddress::insertTargetAddress(), Rose::BinaryAnalysis::InstructionSemantics2::BaseSemantics::MemoryCell::insertWriter(), Rose::BinaryAnalysis::InstructionSemantics2::BaseSemantics::MemoryCell::insertWriters(), Sawyer::Container::Trace< T, IndexTag >::labels(), Sawyer::Container::Set< Function::Ptr >::operator|=(), and Rose::BinaryAnalysis::InstructionSemantics2::BaseSemantics::MemoryCell::setWriters(). Inserts all specified values into this set. Returns true if any value was inserted, false if all the values were already members of this set. Definition at line 230 of file Set.h. Erases value from the set. Returns true if the value was erased, false if the value was not a member. Definition at line 242 of file Set.h. Referenced by Rose::BinaryAnalysis::Partitioner2::CfgVertex::eraseOwningFunction(), Rose::BinaryAnalysis::InstructionSemantics2::BaseSemantics::MemoryCell::eraseWriter(), and Rose::BinaryAnalysis::InstructionSemantics2::BaseSemantics::MemoryCell::eraseWriters(). Erases all specified values from this set. Returns true if any value was erased, false if none of the specified values were members of this set. Definition at line 250 of file Set.h. Erases all values from the set so that the set becomes empty. Definition at line 262 of file Set.h. Referenced by Rose::BinaryAnalysis::InstructionSemantics2::BaseSemantics::MemoryCell::eraseWriters(), and Rose::BinaryAnalysis::BestMapAddress::reset(). Intersects this set with another. Removes those members of this set that are not in the other set. Definition at line 269 of file Set.h. Unions this set with another. Adds those members of other that are not already members of this set. Definition at line 284 of file Set.h. Removes those members of this set that are in the other set. This is like the intersection of the complement but does not require computing a potentially large complement. Definition at line 294 of file Set.h. Compute the intersection of this set with another. Returns a new set which has only those members that are common to this set and the other set. Definition at line 314 of file Set.h. Compute the union of this set with another. Returns a new set containing the union of all members of this set and the other set. Definition at line 323 of file Set.h. Compute the difference of this set with another. Returns a new set containing those elements of this set that are not members of the other set. Definition at line 332 of file Set.h.